This fascinating snail boasts a distinctive globe like shell made up almost entirely of one great whorl about 130mm in diameter topped with 5 or 6 smaller whorls spiraling to a point. (Think about the size of a large fist) The shell can be a pinkish, cream, beige or a deep yellowish brown. 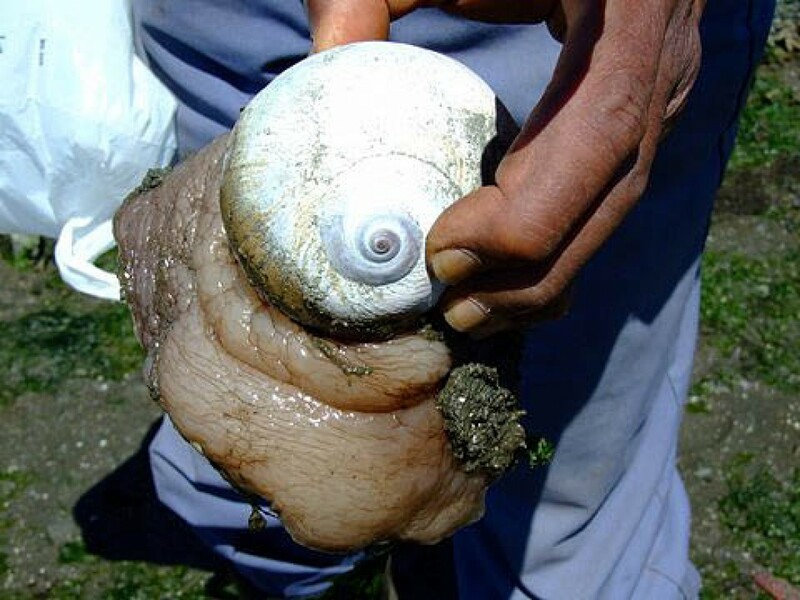 What is most unique about this snail is it has a huge fleshy foot, which extends out of its shell and acts like a snow plough as it ploughs through the sand looking for clams, mussels or other mollusks. This enormous foot, which almost completely envelops the shell, is actually water filled and if the moon snail is disturbed it can quickly expunge the water from its foot and withdraw into its shell. The opening of the shell is then sealed with a tight fitting door or operculum. However the snail does not stay in its sealed shell for long, as it cannot breathe so the whole process is now reversed. The Sunflower Star with its many rays is a feared predator of the moon snail. The moon snail is also cannibalistic and sometimes feeds on its own species !! The moon snail is often not seen because it burrows beneath the sand looking for its food. When it encounters clams it uses its large foot to grasp the clam and then it bores into the clam with its radula a long ribbon like tongue, which contains thousands of teeth. (denticles). The moon snail is equipped with enzyme secretions of carbonic andydrase. This has a softening effect on the mollusks shell and aids the moon snail in drilling through the shell. Clamshells can be found with a perfect hole in their shell near the hinge you can bet they were lunch for the moon snail. Moon snails lay thousands of tiny eggs during spring and summer. The eggs are pressed together with particles of sand to form a distinctive sand collar ring around the snail’s shell. The sand is cemented together by a sticky mucous the snail produces which then hardens and forms a rubberized sand collar. In mid summer the larvae hatch and swim around in the egg collar until it disintegrates and then they swim free in the ocean. The egg collar has the look of something human made. Many are seen at low tide and are sometimes destroyed by people not knowing these are living organisms. June is often a time of extreme low tides. 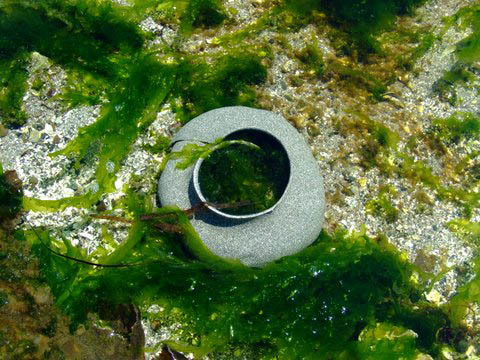 It is a wonderful time to explore the magical mystical intertidal zones around Gabriola. The beauty of the ocean floor is often unseen by many people. Usually covered by 50 m of ocean the kelp, eel grass, clams, star fish, moon snails and many other miniscule inhabitants patiently wait for the inevitable, the tide to return. As we enter their world to explore, care and respect should be shown by being aware of where we walk, leaving specimens where you find them, explaining to others the wonder of the marine life that surrounds the island where we live. ALWAYS CHECK THE TIDE CHARTS BEFORE VENTURING OUT ON TO THE SAND BARS AT LOW TIDE. “Exploring the Seashore” (in BC, Washington & Oregon) by Gloria Snively is a wonderful guide you can take with you to the beach to learn more about this remarkable area of our island. My good friends the Capons gave me this book over 20 years ago and it has been invaluable to my learning about the seashore.